When we lived in our old house, the colors of our patio furniture where all oranges and rust and reds. When we moved here, all the furniture we had didn’t quite fit the patio space, nor was I in love with the color scheme anymore. I wanted blues and greens. 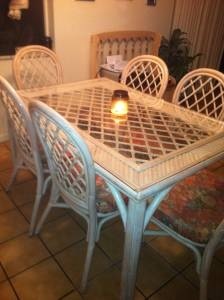 Since we had already either given away or sold the other outside furniture, I put the table and chairs up for sale on Craigslist and sold it within just a few hours. It was easily the fastest Craigslist sale for me, ever. Then, I set to work finding a new set. I found this set on Craigslist. While it looked good in the pictures on the post, in real life, it was filthy and stunk to high heaven of smoke. Ick. It literally took me twenty to thirty minutes to clean each of the six chairs, and another hour and a half to clean the table. I gave all the pieces a quick rubdown with sandpaper, and then painted all the pieces with Rustoleum’s Navy Blue gloss spray paint. Love the color, which isn’t too dark, isn’t too brilliant. After many coats of paint, I was still finding places that I missed. I guess that’s to be expected with all the knots on the chairs though. It took two days and seven cans of spray paint to finish the task, but I love the results. Then, I set off to JoAnn Fabrics to find some fabric. Thankfully, they seem to have finally gotten some new fabrics (seems like they had the same stuff for years! ), and I was able to find three color coordinated fabrics – one pattern, one solid (with texture) and one striped. We stripped off the old fabric, both layers of them, and sprayed the cushions liberally with Febreeze. And then, after they dried, I did that last part again. Seriously, it was crazy how stinky they were. And finally, we recovered them and replaced the cushions on the chairs. I love the finished product! 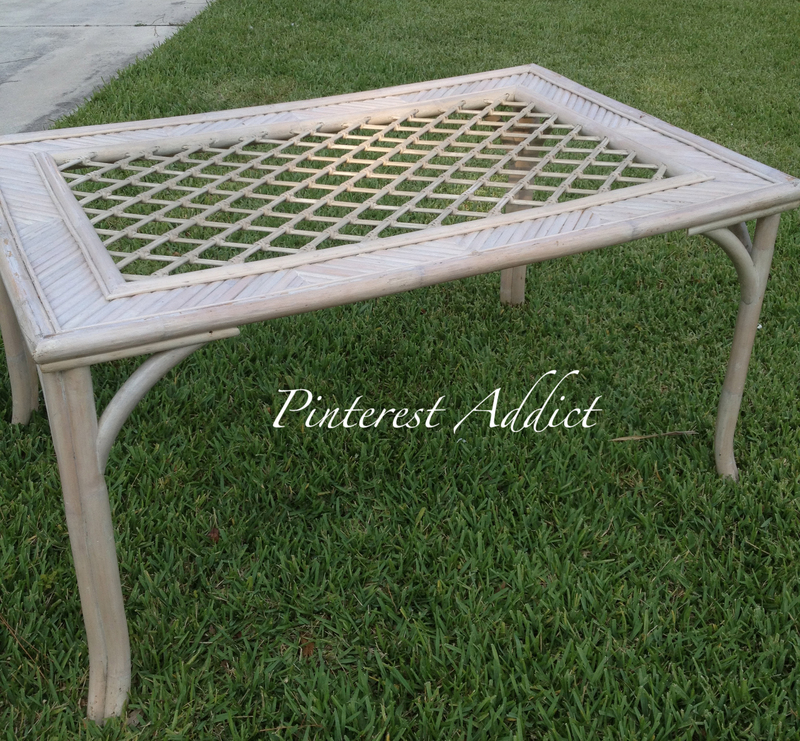 Now, I have to sew new covers for the bench cushions and pillows, and the patio update will be done. Will share that as soon as I finish them. FAB-U-LOUS!!! Is there anything a can of spray paint can’t fix? Eliesa!! This is AMAZING!! I love what you’ve done with that patio set. What a transformation! AMAZING! 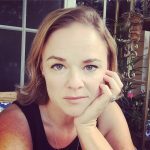 I love your fabric choices! I SO wish I could sew. Beautiful! 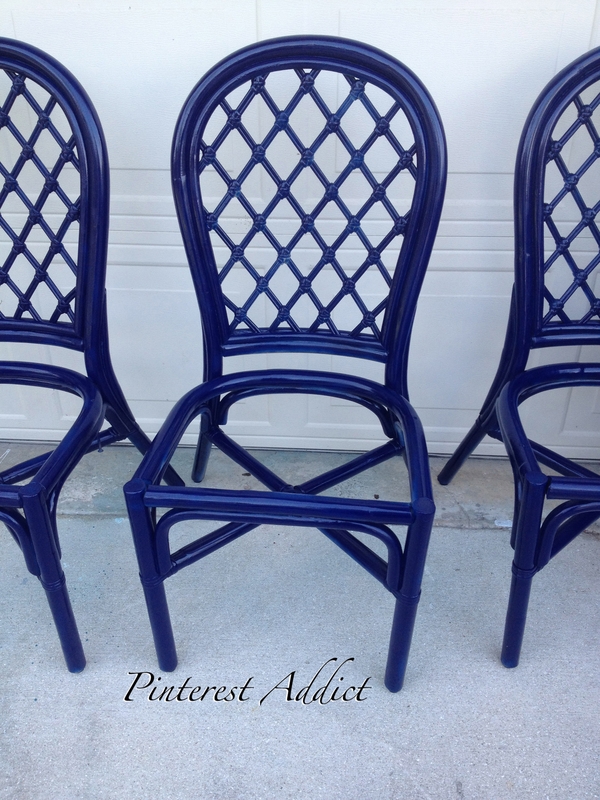 I have been trying to come up with a new color to refinish my old patio set and think you just helped me to decide! What a nice refreshing change from what you see in the stores, Love it!! Holy shitake mushrooms, stunning work!!!! You did such a fantastic job! I am eager to see what else you bring new life to. I love your spraypainted chair as well and sent the link to my sister. Thanks! I hope you both stop by again soon! Love that color! And, the fabric. That looks amazing!! Thanks, I love navy – so glad it’s coming into favor again. By the way, I tried the loyal blue for our bedroom – wayyyyy too dark for in there, but a gorgeous shade! Great work! Love this redo. 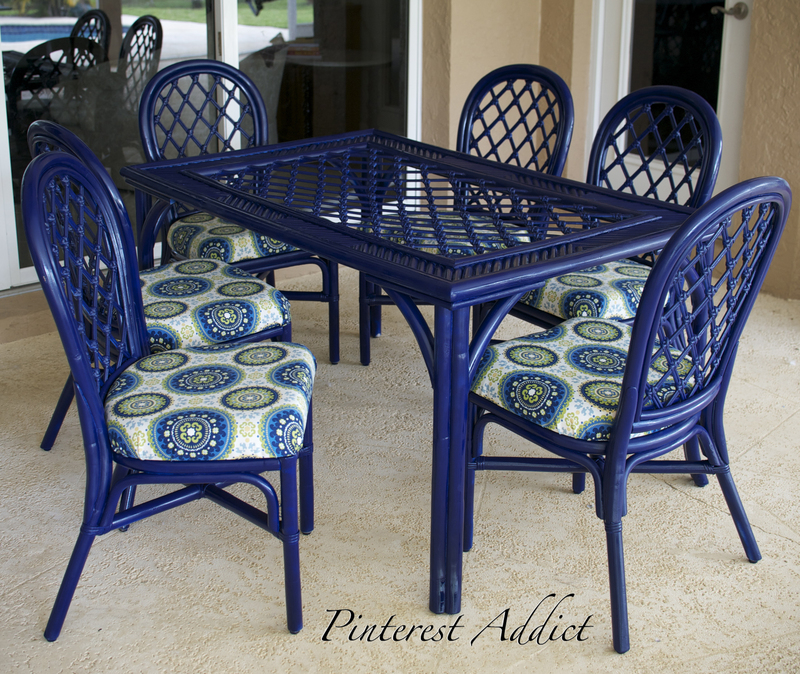 I can not believe you’ve changed the table and chairs so much with just a coat of paint and some new fabric. Hi Patty – I have no idea. I bought it at Joann’s Fabrics, and it’s outdoor fabric, if that helps. Sorry! I don’t have any scraps left to check it either. How many yards of fabric did you need to purchase for the chairs? 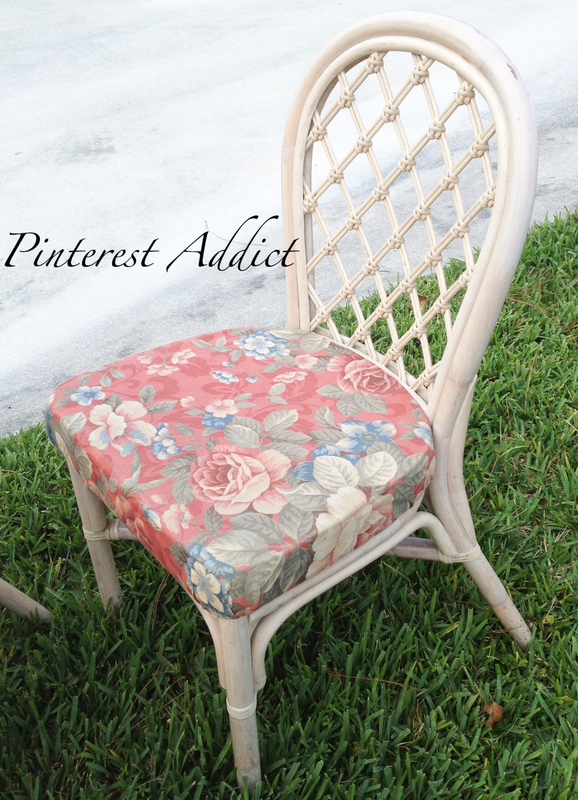 Did you use fabric specifically for outdoors or just any fabric you liked? I’m getting ready to start a similar project and Am wondering how the paint job has held up. Is it hard to keep clean or mold?